Happy to present you the new Globe Media Group website! Globe Media Group is a leading provider of business intelligence that connects over 350,000 legal and intellectual property professionals worldwide. For over 20 years, Globe Media Group has been providing the most trusted business intelligence resource and developing and implementing the latest technologies in the industry. 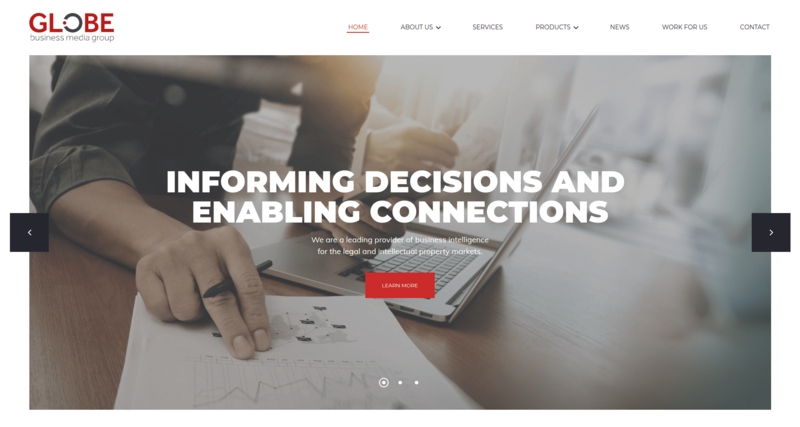 Their services include an in-depth information and intelligence products, intuitive client targeting platforms and market-leading networking solutions. How we worked on Globe Media Group Website? We have worked with the team on designing and developing an online presence that meets the needs and benefits of the international legal and intellectual property professionals. Globe Media Group website is highly customized and designed to provide quick access to all important information once a user lands on a page. We have integrated recruitee recruitment software to provide the easiest hiring process, real-time updates, and 24/7 connectivity with candidates. What you need to know about Globe Media Group? The group was founded with the launch of LawCareers.net in 1996. In 2001, they launched World Trademark Review, which is dedicated to reporting on trademark issues , in 2004, All Hires, the legal talent management software solutions and in 2007, Lexology, the largest online source of legal intelligence that is free to access. To date, there’s an engaged community over three continents that is supporting the growth of the industry and markets. They are organizing different events and awards programs enabling legal and IP professionals to share knowledge and cooperate. Care to know how we work? Learn more about our design and development process and branding services. If you are interested in working with us, fill out the questionnaire and we’ll get back to you with our solutions.